sunflowers - look for us at the sale on thursday! In other news, I’ve decided to try chopsticks for pulling my murrine cane. I curse my clear boro punties every time because they always break off before I’m done pulling the cane. I know from experience that glass sticks to steel and doesn’t like to let go. 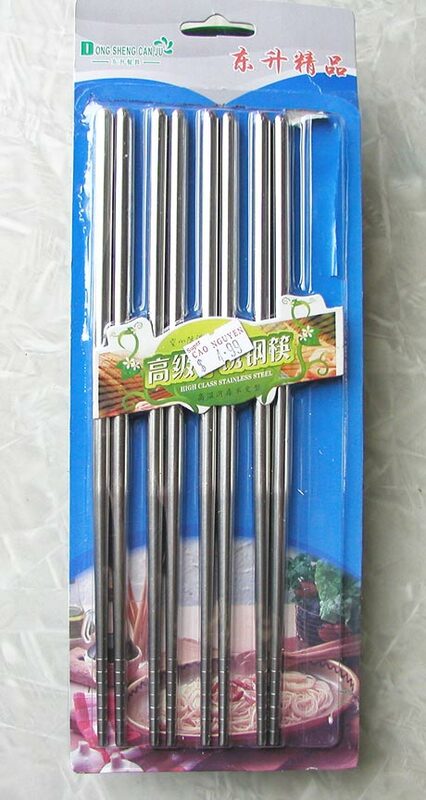 However, I didn’t know until I brought them home that the chopsticks are hollow stainless steel. Does that make a difference in how hot they’ll get? I guess I’ll find out soon enough. I spotted them at the local Asian market… Mr. Sarah and I have fallen in love with that place. They have tofu and interesting sauces galore, and their spices and extracts cost a fraction of what they charge at the least expensive grocer in our area. And some of these spices and extracts make me giggle because they’re packaged similarly to and have the same font as McCormick, but a different name. I can’t remember at the moment what it is. Thanks to Super Cao Nguyen, Mr. Sarah has managed to find the right ingredients to come up with a Pad Thai recipe that’s so good and so easy that we will never pay $8.50 for a skimpy serving of Pad Thai at our favorite Thai restaurant again. Sorry. But we will still eat their overpriced fried spring rolls because they’re awesome and there’s no way we’re going to start deep frying stuff. We have to draw the line somewhere. We really don’t want Jerry Springer cutting a hole in the wall and rolling us out on a flatbed tractor trailer. I never had Thai or Indian food before Mr. Sarah came along, and I remember him asking me when we first got together if I wanted anything from the Thai food restaurant. I adamantly declined, but he gave me a taste of his Pad Thai when he brought it back and I was impressed, even though something about it made me a little nervous. Turns out, it was the fish sauce. If you’ve never had Pad Thai before, I’ll tell you about it. It’s made with rice noodles, tofu, scrambled eggs, bean sprouts, green onions, red pepper flakes and peanuts. I could be forgetting something. It’s seasoned with sugar, fish sauce, rice vinegar, tamarind, and maybe a couple of other things I can’t remember. The sauce is not soupy like spaghetti; it soaks into and coats the noodles and vegetables. Mr. Sarah also uses bok choy, which is really good for you and adds a lot of flavor, and we sprinkle fresh bean sprouts on top. It’s paradise. I guess I need to stop talking about food and get this posted. I dreamed about food yesterday during my nap – greek food, mainly, and that some random (but nice) guy came over and ate my last can of Chef Boyardee ravioli. Whatever. Thanks for reading! 2. I don’t keep sketchbooks, because I can’t draw. I keep notebooks instead, and college ruled only. Several at a time. The most active being the one on the bottom left, with ideas and lists of stuff I want to make. My penmanship is deplorable. I prefer Sharpies to most other writing implements. 3. I like candy. Here, you’ll find a Tupperware container 1/4 full of Starburst jellybeans and an empty wrapper for a heart shaped York Peppermint Pattie that Mom gave me yesterday. Mom is the best Mom anyone could ask for. I wouldn’t change a thing about her. 4. I have too much glass. The colorful stuff in the middle is what I had to get out of one of the drawers to get to other colors, and I’ve been too lazy to put it back where it goes. 5. That cliche about artistic types being slobs also applies to me, most definitely. 1. I’ve been conquering obstacles like stuck tank caps, lack of storage, and strangers in my house with unusual grace and flair this past week. 2. I haven’t ranted and raved about any perceived injustices because, frankly, I just don’t care at the moment. All I care about right now is being happy and making more beads than I have in a long while, and I’m actually accomplishing it. 3. I’m really enjoying all of this me-time at the torch. Off to work with me… thanks for checking in! It’s been so warm, so suddenly! The snow has mostly melted, except for the 7 foot mounds of grey icy muck in parking lots and on curbs at busy intersections. After being stuck inside for practically two weeks straight, Mom and I enjoyed a trip to the bead store, and even to my accountant’s office, over the last couple of days. I asked Mr. Sarah and his Spawn what they thought of the brown one. They were both kind of “meh” about it. They both seem to think that every piece of jewely I make must include my own beads to be considered impressive, so my feelings weren’t hurt in the least. 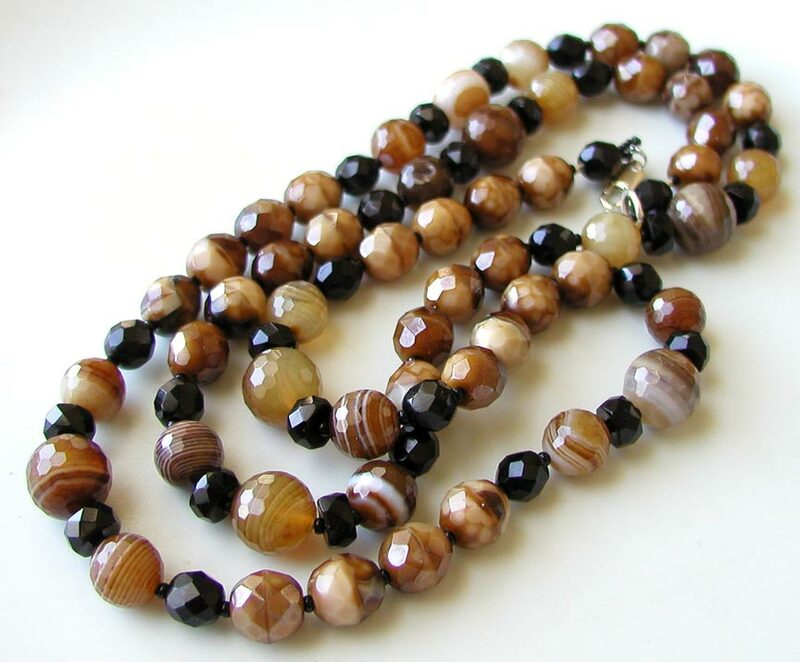 I personally love the simplicity of the unusual brown/beige faceted Czech beads combined with the stripey agate, and its delicate profile makes it very comfortable to wear. This may come as a shock to some of you, but sometimes, it’s kind of nice not to have to worry about or even look at my own beads, and big honking lampwork doesn’t fit every bill. 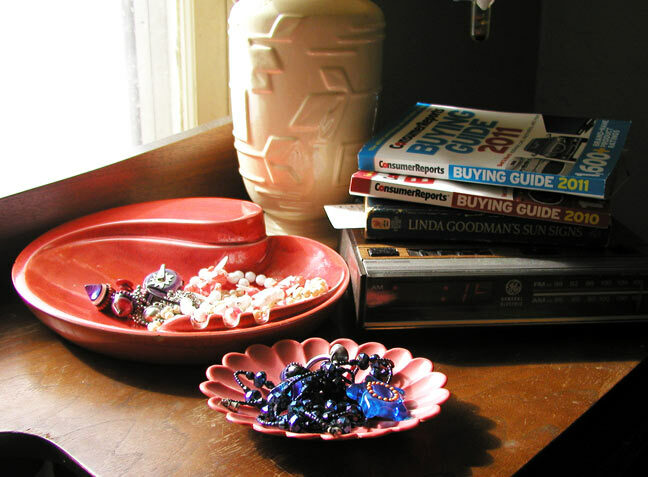 I was making jewelry before I was making beads… way back when authentic, well packaged, high quality Czech beads were easily found at crafty stores like Michael’s and Hobby Lobby, and in the clearance area, even. I really miss those days. The Hobby Lobby I grew up with and loved the best is now closed, of course, and has been for many years. It was cozy with low ceilings and shelves and took up an entire strip mall. Each interest had its own room, and a doorway divided each room. I spent so much time there, I knew that place like I knew my own home. There was something new and exciting on the shelves every few months. And it was fun to go to all the Hobby Lobbies around town because each one had slightly different stock. Now, all the Hobby Lobby stores look and feel the same, and are very reminiscent of a Wal-Mart, and they all have the same stuff, all the time. Times have changed, but I still terribly miss that Hobby Lobby on 10th and Portland, and will always associate it with the good old days. The blue necklace includes old lampwork beads from where, I’m not sure. They have a white base with fine opaque turquoise frit and goldstone flecks. They’re one of my top favorites of the old beads Aunt Joane passed on to me. A few have cracks on one side, but I don’t care, and they seem to be pretty sturdy. These used to be strung with just the evil purple spacers you see here, with periwinkle size 6 seed beads, but I rearranged things a bit with some larger Czech faceted opaque light periwinkle and made it long enough to double up. I had a dream about ebay right before I woke up. I dreamed I had two auctions and one had been bid up to $1,153. At the last second of that auction, a bidder retracted their bid and the auction went for $5.38. I wonder what that meant, and specifically, those numbers. Sometimes I find myself missing ebay, but when I think of the fees and all the new crazy rules and the fact that so many of my buyers abandoned it long before I did, it quickly loses its appeal. It’s time to get ready for work… Before I do, I should mention that there may not be anything on Etsy this week. I’m still working up mondo stock for the upcoming boro binge, and may save most of those for Superstars sales through the end of the month and March. But we will see, I may surprise you! Woohoo! Great stuff for your eyeballs! Click HERE to visit my shop, or the thumbnails below for the individual listings. dotty isles - click me! flaming flames spikes - click me! Okay! Now that that’s done, I can get back to work on the jewelry. Thanks so much for having a look! The internet, in fact, is not completely made of warm fuzzies. If it were, my server wouldn’t have been hacked and my site wouldn’t be offline. These things happen. We’re working on it and it should be up again soon. The host, Bluehost, is right on top of things. They yanked our sites to help protect you from malware. We love those guys. Meanwhile, I’m preparing some glassy sparkly dotty fancifuls for ETSY! Look for them within the next several hours. And once that’s finished, I’ll get back to work on Mom’s Collection Inspiration necklace, No. 2. This time, black and beige. I’ll show you when it’s done. We have 7 inches of snow today – beats the hell out of 12 inches. It’s light and fluffy. It will melt quickly. I hope. It’s already warmer than predicted, the sun is shining hard, and according to the newest 7 day forecast, we’ll be back up to 70 degrees within the week. In other words, the shipping of today’s Etsy offerings looks good for Friday, when we’ll be over the 32 degree mark. …there’s Bead Happiness. There’s marital bliss, there’s financial security, and of course, fuzzy kittens. That’s all great, but Czech firepolished glass deserves its own classification of sheer, unmitigated joy. The cobalt’est cobalts, the facet’est olive greens, the opal’est browns. 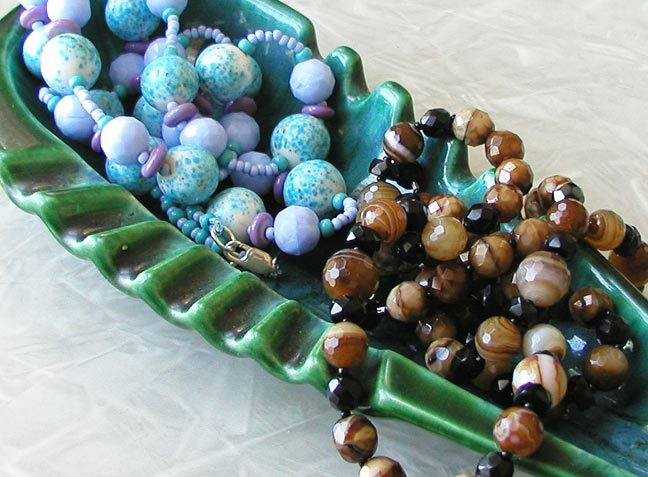 By the by, have you seen the Shipwreck Beads catalogue? It has a panoramic photo of their retail store that spans the front and back covers. By the looks of things, I would die of overstimulation the very moment I came through the door. The last 12 inches of snow is mostly melted, and hey, just in time for about 10 more! Fantastic. I’m planning my Etsy listings around my ability to get to the post office, and I’m hoping that on Wednesday (that’s the day of only 9 degrees and all of that snow) I’ll get some stuff listed. Then with Thursday’s sun and Friday’s high temperature, Friday and/or Saturday looks good for shipping. Well, as of today. 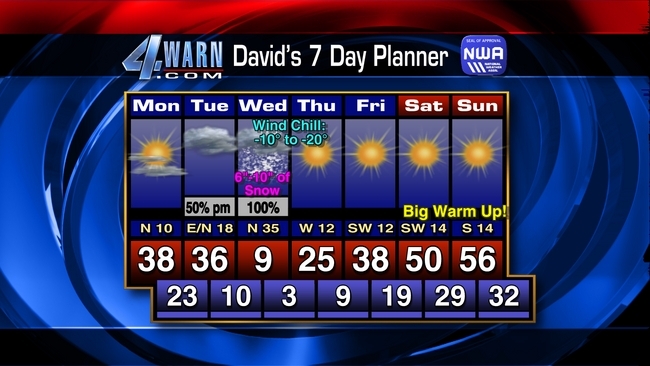 A couple of years ago the weather folks predicted a blizzard the following day, and we got absolutely nothing in OKC. The weather man demonstrated how the precipitation completely bypassed the metro area with the assistance of a doughnut and a sheepish grin. Or maybe it was a bagel. Either way. Off to work with me… thanks for reading! 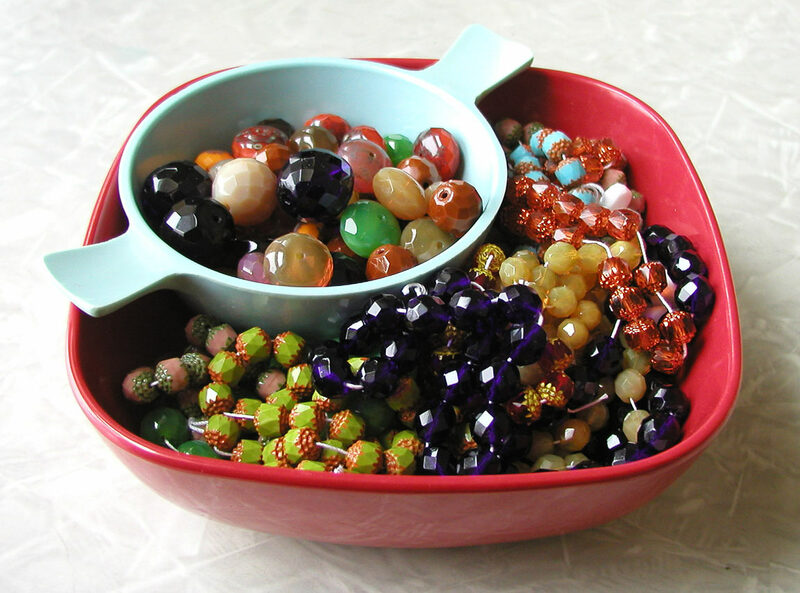 I think I mentioned making a necklace from some of my Czech beads. This one was made from vintage pressed German and faceted Czech glass. It was inspired by one of the first necklaces Mom made when we discovered beads together. 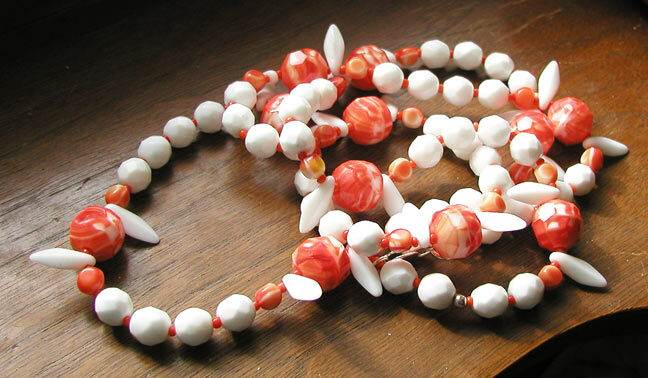 Hers is orange and white, too – small round white beads with orange frit and plain white rounds and size 8 seed beads. I’m attempting to “re-create” my favorites amongst her collection to flex my jewelry skills and step outside of my comfort zone. I’m unable to replicate them since I can’t find the same beads, so I’m going more for a length and color theme. I’m thinking I might actually get to melt some stuff. Sure, it’s 18 degrees, but if I wait a few hours, maybe it will warm up a bit. I guess I’m feeling plucky today. And speaking of the recent Zodiac debacle – I’m so not a Libra. I’m a Scorpio all the way, and so is Mr. Sarah. As you can see in the first photo, I got out my trusty old Linda Goodman’s Sun Signs to solidify what I already knew, and she’s pretty much dead on. I’m somewhat comforted by the hearsay that the new arrangement only applies to people born after 2009. Scorpio seems to be the least popular sign among the stars or whatever – we only have a 6 day window now. 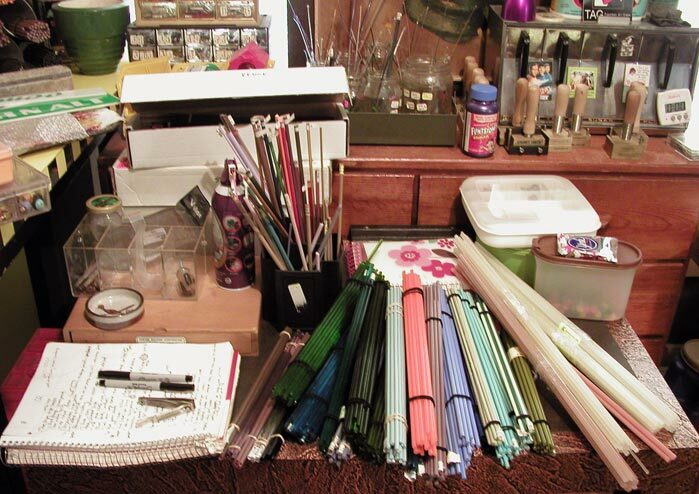 So, blah, blah, blah – the bead room is warmer, so I guess I ought to get ready to work. I’ve donned my tights, long socks, several layers and my really big shoes. As usual, after several days of forced vacation, I can’t decide what I want to do because I want to do all of it. Maybe I’ll make only a few murrine canes, a few test beads and finish up a set I was working on. I’m thinking Etsy will have to wait – since it’s warm today, I’ll make more stuff instead of sit at the computer. I’ll save that for a much colder day, and believe me, it’s coming. That’s what Mr. Sarah keeps saying. I think we got 12 inches. It’s worse than the last one in December 2009 because it’s so much colder, even though there is a bit less snow. Mr. Sarah doesn’t mind being snowed in because it means he doesn’t have to go to work. I, on the other hand, do mind being snowed in if it’s too cold to open the window and work. My kiln temp in the bead room read 56 degrees the other day before I turned it off. It warmed up to a blazing 9 degrees yesterday, with wind gusts up to 50MPH. Snow blew in under the small crack under our front door. I’m so over this. But very thankful that I have a warm (albeit somewhat drafty) house to live in. 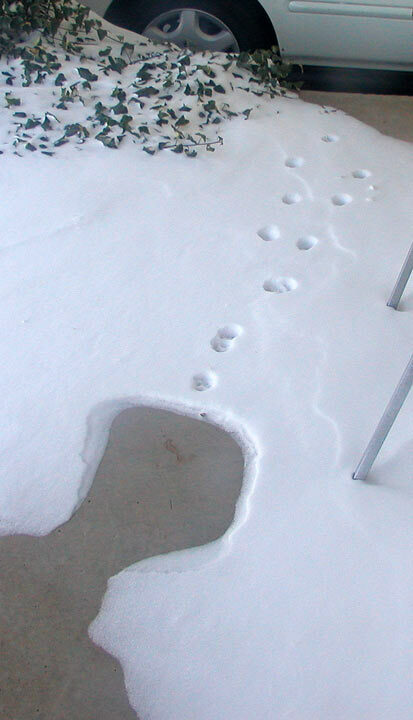 …and sad, defeated little footprints going in the direction of my driveway. Poor frozen kitty. Today, it’s 0 degrees Fahrenheit. At least we still have power. 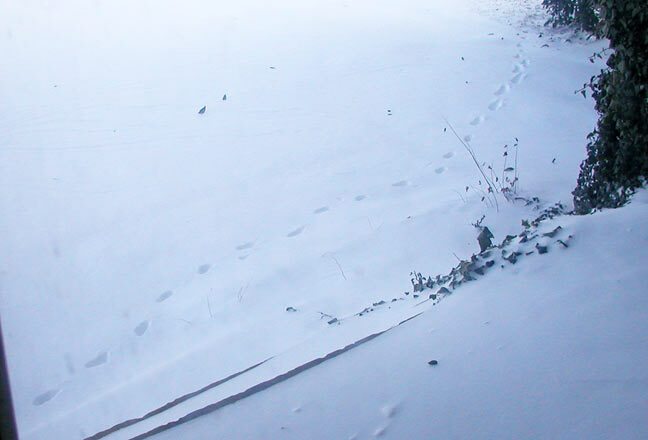 Mr. Sarah made himself go to work, and plowed out of the unshoveled driveway in the petite Honda like it was nothing. Thanks be to standard transmissions, dry powdery unmelted/refrozen snow and no ice underneath. But I still refuse to drive on that, I’ve always been terrible at it. I have new murrine cane ideas, but I may have to settle for creating a catalogue system for my already existing ones. I don’t keep notes on everything I make, but I’ve managed to keep notes on 95% of the murrine canes I’ve made so far. Sigh. Two days without being able to melt some stuff, and today looks like another day of that. Maybe I can make jewelry, or do my taxes, or move some furniture. I have done all of that, and will probably do some more of all of that. Anything but what I did Tuesday – lay in bed and watch netflix movies for 8 hours. Paying full attention to movies does something weird to my brain, and I can literally feel the hypnosis trickle down and envelop my skull like someone cracked an egg on my head. I guess I’m not good at just laying around – it makes me hungry and tired, even though I’m not really hungry or tired. Or maybe it’s the movies I watched. Really good movies are hard to find, especially for someone who wouldn’t know where to look or how to pick a good one. The Netflix watch instantly feature leaves much to be desired unless you’re a documentary junkie. Which I’m not. Did you know there is a documentary about the Helvetica font? Now you do. Do whatever you want to do with that information. Hum. I do have a couple of cool single beads… Maybe I’ll put them on Etsy today or tomorrow. Right now, my internet connection is reeaallyy slooow and it’s making me a little crazy. And hey, are you guys going to make me keep the Candy Wrapper Glimmer Strip beads? That would be so awful, since they’re some of my favorite beads ever. Thanks for checking in! Send warm thoughts my way so we can melt this crap and get me back to work! I don’t have time for this frozen nonsense.